Spare part for Juwel aquariums. Diversion Nozzle Set included. JUWEL Eccoflow pumps are the latest generation of JUWEL flow pumps. In all Eccoflow pumps, the impellers are on a double bearing system and are specially tailored to the individual motor rating. This is what creates the extra operating quietness and low power input of the Eccoflow pumps. 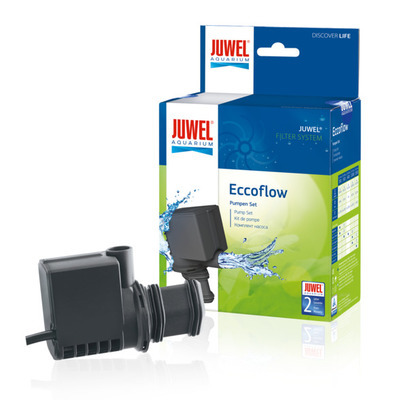 If you use the ceramic axles, which are available separately, JUWEL Eccoflow pumps are also perfect for use in saltwater aquariums. The bypass flow principle means that the impeller chamber is constantly and automatically cleaned. As you would expect, the JUWEL Eccoflow pumps comply with the highest safety standards and are T�V/GS certified. JUWEL Eccoflow pumps are available in performance categories 500, 600, 1000 and 1500 l/h and are perfect for use in the JUWEL filter system. Spare part for juwel aquariums (85772). Diversion Nozzle Set included. Spare part for juwel Rio 180, Vision 180 and 240, Trigon 190 aquariums (85774). Diversion Nozzle Set included. Spare part for juwel aquariums (85776). Diversion Nozzle Set included.